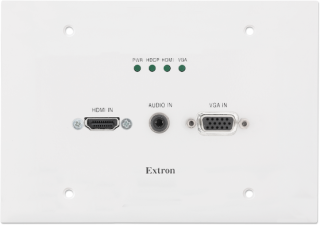 The What: Extron Electronics’ new XTP T UWP 302 is a two-input XTP wallplate transmitter that can connect local source devices at a wall or other locations, including a lectern or floor box. The What Else: This XTP transmitter mounts into a standard three-gang junction box, and sends HDMI or RGBHV video, audio, and control up to 330 feet (100 meters) over a single CATx cable. It is HDCP-compliant and supports computer-video to 1920x1200, including HDTV 1080p/60 Deep Color and 2K. The XTP T UWP 302 features automatic switching between inputs with selectable prioritization, and can be powered over the same CATx cable. The XTP T UWP 302 is designed for use in XTP Systems for signal distribution and long-distance transmission between remote endpoints. The XTP T UWP 302 can transmit HDMI with its embedded audio, or alternatively, embed audio from a separate analog stereo input prior to transmission. The XTP transmitter features EDID Minder, which is designed to ensure continuous EDID communication between devices. For transmission of HDMI signals with protected content, Key Minder authenticates and maintains HDCP encryption to provide quick and reliable transmission across the XTP System infrastructure. Why This Matters: "This wallplate transmitter for XTP Systems enables easy AV access for guest presenters or when bringing in temporary sources," said Casey Hall, Vice President of Sales and Marketing for Extron. "The XTP T UWP 302 transmitter offers the flexibility to accept digital or analog signals, in a discreet wall or furniture installation."